Ford Has A Futurist! Who Knew? At Austin’s Wanderlust venue, Sheryl Connelly, Global Consumer Trends & Futuring Manager for Ford Motor Company, offered Lessons from a Futurist. Connelly noted how Ford examines global trends, considers both plausible and implausible future scenarios, and then attempts to understand what can be done today to address potential future outcomes. These can range from the price of a barrel of oil skyrocketing to what happens if aliens land on Earth. To look outside the automotive industry to understand what’s happening in social, technological, economic, environmental and political arenas so that we can understand shifts that are coming that may influence consumers’ values, attitudes and behaviors. I look for those insights and collaborate with people in Ford Design and Product Development who try to turn them into business propositions. These propositions can vary greatly. For example, people may prefer to retain ownership of their cars longer than they used to. Or a protracted recession may give them no choice. In an always-connected world, that may mean that some car features – including voice recognition, apps and connectivity – need to become more swappable, easily and cheaply replaced by newer modules with newer features. It also means that you might be able to take your apps with you from vehicle to vehicle. To learn more, I spoke with Scott Lange, Executive Creative Director for Team Detroit, who Connelly at the presentation. Team Detroit was a sponsor of her presentation and works closely with Ford on mobile marketing strategy. Lange noted that several auto manufacturers are actively pursuing partnerships and want to provide “open access” to once-proprietary car data -including diagnostic information, real-time information from a car’s various micro-controllers and sensors, speed, ambient temperature and more. Lange singled out Ford’s OpenXC project. 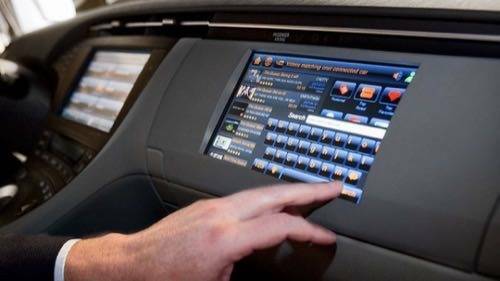 What if the user-facing hardware and software was independent from any one vehicle, and could be purchased and installed by consumers as an aftermarket add-on? What if the infotainment hardware was more modular and user-upgradable, and perhaps most importantly, transferable from one vehicle to another? Consumers have already taken this approach to some degree by using their smartphones as the primary navigation, media and communications hub. However, the known dangers of using a handheld device while driving necessitate better vehicle integration to provide safer, more context aware interfaces. Transportation Apps and the Sharing Economy – How the sharing economy is altering consumers’ views on car ownership and transportation. Shaping UX When Users are at the Wheel – Optimizing car sharing platforms. Hacking Transportation Meet-Up – From shared cars and rides, to electric scooters, to computer driven cars. Image of “Connected Car” courtesy of Flickr.